Do you want to rent a car in Ascoli Piceno but you don’t know how to do it? GoCarRental.com is the right solution for you, helping you choose among the best offers from more than 500 car rental companies. 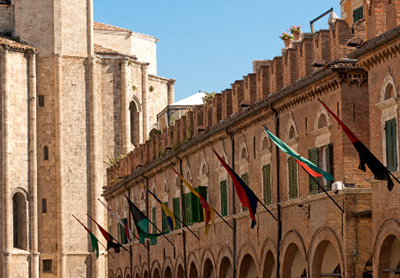 Renting a car in Ascoli Piceno will give you the chance to discover one of the most fascinating areas of central Italy. The city of Ascoli is indeed famous for being an urban centre built on a human scale, enriched by such remarkable and prestigious monuments such as the beautiful Cathedral and the buildings around Piazza del Popolo. To find a low-price car rental service in Ascoli Piceno has never been so easy with GoCarRental.com: just choose the best car for you, book it and pay for it by the major credit cards. Start immediately to look for the best solution for you to rent a car in Ascoli Piceno, and don’t miss the opportunity to visit its beautiful surroundings, such as San Benedetto del Tronto, Femo and Tolentino. Renting a car in Ascoli Piceno will make your holiday in the Marche a relaxing and enjoyable experience. But there is no time to lose, start looking for your low cost rental car, now! Renting a car in Ascoli Piceno is definitely the ideal choice if you want to experience the beautiful synergy between culture, outstanding landscapes and ancient traditions of the Marche area, and the amazing thing is that you can do it in a convenient manner, avoiding any unpleasant surprise that may spoil your wonderful stay.